When I was training to be a docent at Grace Cathedral, I learned that Grace was the third-largest Episcopal cathedral; the National Cathedral in Washington, DC, is second; and St. John The Divine in New York is the largest. But that information didn’t prepare me for the magnitude of St. John the first time I walked through its doors: Grace Cathedral, as large as it is, is tiny compared to St. John. 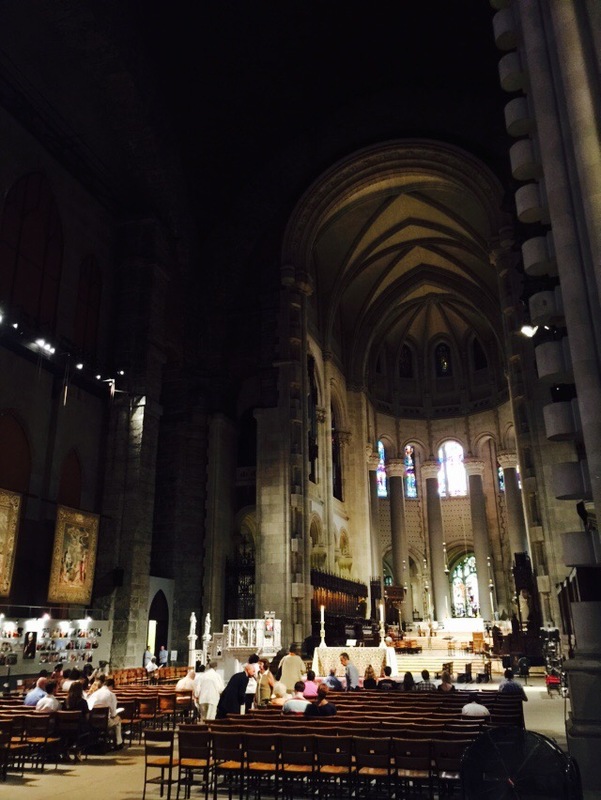 I first visited the NY Cathedral in the spring of 2014 with my then-girlfriend (now wife), one day after I interviewed with the Council of The Brotherhood Of Saint Gregory and was accepted as a postulant prospective. Our visit didn’t coincide with a worship service, but we took the tour and spent some time praying and wandering around. What struck me most was the crossing—the part of the Cathedral where the arms of a cross meet (though technically, there’s only one arm of this particular cross, since the transepts of St. John have never been built). The main section—where the congregation sits—and the apse—where the choir and liturgical ministers traditionally sit—are both a light grey, a mix of marble and poured concrete. But in the crossing, the large stacked stones are visible—rough dark grey blocks of the sort used for castles, ancient forts, or much older cathedrals. And the ceiling of the crossing is only barely visible if one really strains one’s eye: it’s pitch black, and of course very high. Add a little incense smoke and it’s impossible to see what’s up there. It’s a mystery. The whole area of the crossing feels much darker than the rest of the nave. To me, it’s actually a bit scary! I’m not quite sure why, but there’s something frightening about that mysterious space so far overhead. But a good sort of frightening, like something too wonderful to be contained. I love that crossing: it scares me to death! 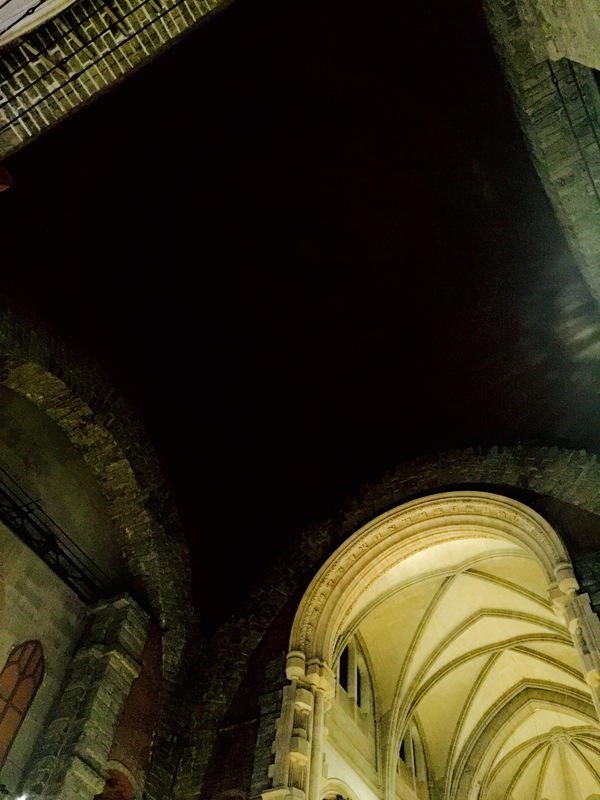 So since that first visit, I’ve wanted to experience a worship service in the nave of St John the a Divine—to sit at the crossing under that mysterious invisible ceiling and ponder the mysterious invisible God it was built to glorify. And this past Sunday, I got to do just that. I shared the divine mystery of the Eucharist under this ceiling which for me symbolizes the Great Divine Mystery. And it was wonderful. The BSG habit that I’ll receive this week includes a zucchetto—a small skullcap with a little stem in the top (if you’ve seen a picture of Pope Francis, you know what a zucchetto looks like). The zucchetto’s origins are practical: monks and friars developed them centuries ago to keep their ritually-tonsured heads warm in chilly chapels. But the after-the-fact theology that has emerged around zucchetti includes the idea that they are meant to remind the brother wearing one of the divine presence always over his head. When I wear my zucchetto I’m going to imagine the divine presence over my head in the mysterious crossing at St. John The Divine.